Hoyle, Tanner was recently selected by the City of Manchester, New Hampshire to provide professional engineering services to assess the condition of the Victory Parking Garage and identify any repairs and maintenance issues. 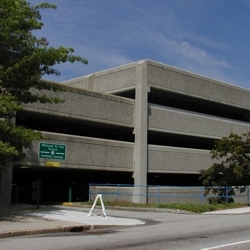 The Victory Parking Garage is a five level, precast double tee structure with approximately 850 parking spaces. Hoyle, Tanner previously provided inspection and designed repairs for this City-owned garage including replacement and repairs to the stair towers, concrete spall repairs to columns and deck topping and reapplication of the deck waterproofing membrane. Rehabilitative designs also included repairs/improvements to garage stairwell to correct structural deficiencies and improve access. We look forward to continuing our working relationship with the City of Manchester.